Catherine Palace at Tsarskoe Selo in the town of Pushkin – every person wishes to visit this museum with St. Petersburg private guide. The Amber Room of the Catherine’s Palace is considered to be the 8th wonder of the world and attracts thousands of tourists every year. Tsarskoye Selo is a UNESCO site. One-hour time to reach the suburban museum-reserve flies quickly as your guide helps you to travel through times and find yourself in the 18th century, the year 1712. Then Peter the Great founded a mansion for his second wife Catherine I – from here comes the name of the Palace. About 15 years later there followed the reign of Peter’s and Catherine’s daughter Elizabeth. She turned comparatively modest and practical mansion of her parents into luxurious official summer residence of the Romanovs. The style was French baroque, and so the gold is sparkling in the eyes of an overwhelmed visitor coming into the Grand Hall and proceeding like an ambassador from one golden room to another. The Golden enfilade seems to be never-ending, like a mirror reflection leading you to a wonderland of the 18th century performed by the Italian Rasstrelli. Catherine palace as if another human-being was changing through times and you will be definitely fascinated by the rooms in classical style as well. They were commissioned by the wife of Peter III (Peter the Great’s grandson) – Catherine II, known as Catherine the Great. Nearly every Romanov added something to the beauty and history of this palace. The major scale of works which completed the ensemble inside and outside was done by order of Catherine the Great. She loved Tsarskoye Selo better than any other summer residence, and though this place bears the name of her predecessor, wife of Peter the Great, the beauty of Catherine’s park is the taste of the second and “the Great” Catherine. This unique interior is adorned with the panels made of natural amber, which is petrified pine-tree sap. The work was done in mosaic technique. One can easily imagine jewelry or small items made of amber. In Catherine palace you will see the amber panels covering the walls! That’s really unrivaled décor. The history of the Amber room is connected with the names of the Prussian King Friedrich the Great, who commissioned it, and Russian Tsar Peter the Great, who received the Amber Room as a diplomatic gift. Russian Empress Elizabeth moved the Amber panels from St. Petersburg to Tsarskoe. The Amber Room stayed in the Catherine’s palace until the Nazi-German occupation of the town of Pushkin: it was stolen during WWII. Russian craftsmen were working on the Amber Room’s revival since 1979. The Amber Room was opened to the public in 2003 – wonderful present for 300th anniversary of St. Petersburg. It reflects the soul and mind of the talented architects, gardeners, sovereign customers. The park, which is about 100 hectors, got changed significantly in the second half of 18th century. Almost nothing was left from the formal garden a-la Louis XIV. Only the historic paintings remind us about the trimmed trees, artificial rectangular pond, and radial walkways, which were gone with the time. Walking in the park these days, you feel united with nature. And that’s due to Catherine the Great, enlightened Russian Empress inspired by Diderot, Russo and Voltaire. The Catherine’s park today is mostly in the English style. Your St. Petersburg private guide will pay deserved attention to its beautiful sights. Natural outlines of the banks would never make you think that it is hand-made and fed by the springs, which is absolutely true in reality. Walking around the lake you are always surprised by something beautiful and unexpected, opening to your eyes with every step: a pavilion, obelisk, bridge. Especially attractive are the Grotto pavilion and the Admiralty, the Turkish Bathhouse and the Chesme column. In the shade of the grounds one can discover attractive pavilion called Hermitage where it is possible to see the elevating table under a special request on a tour with us. These sites are just a few to mention. Special attention should be devoted to the creation of the Scottish architect Charles Cameron. This is one of the most perfect structures of classical style with harmonious rhythm of the white columns and a magnificent view from above. 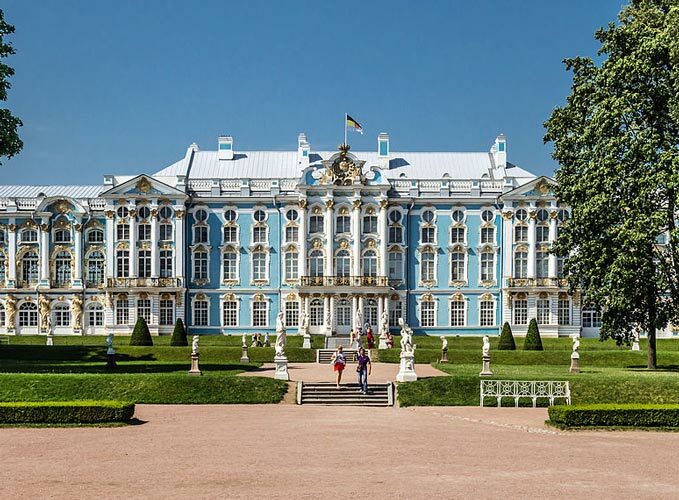 It belongs to the “corner of Catherine the Great” at Tsarskoye Selo, which includes the Pavilion Agate Rooms, Hanging Garden with the ramp leading you to the park and the Private Garden of the Empress. Fascinating ensemble of palaces and parks of Tsarskoe Selo is waiting for you on your tour with St. Petersburg private guide of Kremlin Tour Company!